Designed to fit like a comfortable backpack, SUNSAC™-FOCUS comes with 2 large compartments including a padded laptop sleeve and an additional tablet sleeve in the front along with 4 concealed pockets a strong stretchable mesh pocket with a bottle security system. We give you Jacket-Style Back straps to ensure your shoulders never feel sore. And an additional semi-padded pocket in the front to hold a gooseneck-lamp and secure it in place. 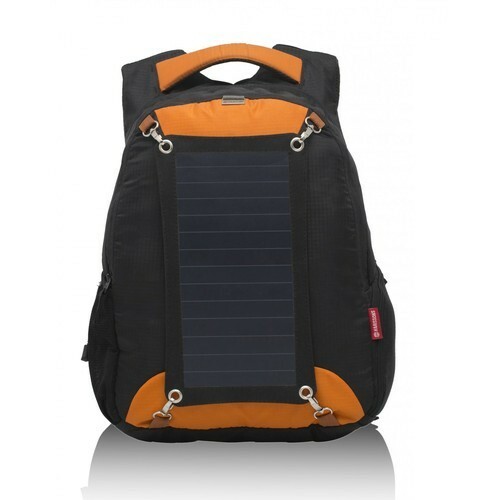 The 7-Watts Super Slim Solar Panel features premium solar cells and a hardened anti- scratch coating. The high efficiency SUNPOWER® solar cells deliver unmatched performance and reliability in all environments at a conversion rate of up to 23% which is very high! (5% above the average solar panel and 12% more than solar fabrics) capturing more sunlight than conventional solar panels, which means it generate more electricity. The panel itself is completely detachable, enabling you to point it in any direction the rays fall to optimise charging. You can charge your device with its 5-volt USB output port while its intelligent voltage regulation module keeps your battery safe. SUNSAC™ solar panel comes with a precisely measured zippered mesh pocket at the back of the panel to hold your devices in place whilst charging in the sun. Established in 1959, Harissons offers a full basket of products including but not limited to luggage bags, travel totes, sports bags, duffel bags, backpacks, school bags, college bags, messenger bags, office bags, handbags, pouches, and many other accessories. With over 800+ retailers in over 18 cities, Harissons is the most trusted and leading bag manufacturer in India. The Company designs and manufactures these bags using tough fabrics such as nylons and polyesters, coated with special chemicals to add strength and make it waterproof. The bags are designed to be user-friendly with varied functionality combining style with comfort. Harissons is not only the OEM for certain brands but also manufactures bags in large quantities for large corporates & multinationals in various industries like IT, pharmaceuticals, insurance, to name a few, and also educational institutions providing world-class design, highly competitive pricing, fast turnarounds, and exceptional product quality. Harissons has the vision to be the most widely distributed and recognized quality conscious brand in the country. Every product is designed with only one thing in mind – customer satisfaction, whether it is the appearance, quality, usability or durability. Hence Harissons' mission is to create high quality, user-friendly and attractive bags tailored to meet the customer's needs and to constantly utilize the company's resources to innovate new products for the ever-changing desires of the consumer. The logo embodies the very vision of Harissons. It is an 'H' (which stands for Harissons) touching the edges of a circle, representing the wide distribution network which covers every part of the region in which Harissons operates, i.e India. Furthermore, the 'H' in the logo is constructed to represent two plus signs – to show that our growth is additive and our attitude is positive. Quality is our top priority. A special quality assurance team has been set up to check each and every piece that is manufactured. Moreover, each and every raw material is first tested for its strength, durability, color fastness, etc. Every stress point in the finished product is reinforced with additional stitches for better strength. The final product is then jerk tested, along with other tests, after filling it with full capacity weight.